The Sigiriya ladies were a major media story this week with reports that flash photography was spoiling the masterly frescoes and tourists were jaywalking on the ancient walls but the real problem comes from the “experts”. “Right now, what you see in Sigiriya is the damage done by the people who attempted to preserve the murals 30 years ago,” said the Director of the Postgraduate Institute of Archaeology (PGIAR) Prof. Jagath Weerasinghe. 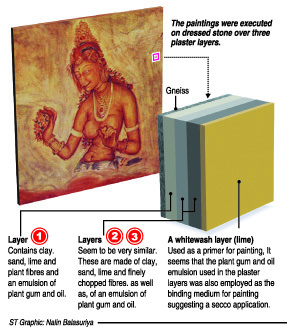 A report states the colour alterations of Sigiriya frescoes could be due to the deterioration of the PVAc (polyvinyl acetate) protective layer applied over their surface in 1943. The “Mission Report on the Conservation of Wall Paintings at Sigiriya, World Heritage Site” compiled by Dr. Christian Fischer and Dr. Ioanna Kakoulli of the University of California Materials Science and Engineering Department and the UCLA-Getty Conservation Program/Cotsen Institute of Archaeology together with Prof. Weerasinghe and PGIAR senior lecturer Dr. Arjuna Thanthilage, states, “[T]he recent appearences of a white/pinkish veil, particularly visible on the paintings in the northern area of the main recess that has been attributed to the alteration of the PVAc layer based on scientific analysis, has prompted two conservation test trials aiming at its removal. The first documented conservation intervention on the Sigiriya wall paintings was carried out by an Indian restorer who applied PVAc in 1943. Then in 1967, some of the paintings were vandalised with green oil paint being smeared over several female figures. An Italian restorer, L. Maranzi, removed the green paint and retouched the frescoes with watercolours in 1967 and 1968. By 1972, however, the watercolours had faded due to direct exposure to sunlight. Now, if one takes a closer look at the murals, small black holes used to inject chemicals as a process of the restoration, could be seen in many parts of the murals, Prof. Weerasinghe said. These findings suggest that the Department of Archaeology has failed all these years in its task of protecting and restoring the UNESCO World Heritage site, the country’s major tourist attraction. Experts say conservation of an ancient mural cannot be done by a person with a mere knowledge of chemistry or even by an artist, but by a conservator with a thorough knowledge of science, technology, art, history and culture. The Director-General of the Central Cultural Fund, Professor Prishanta Gunawardhana, agreed that that was indeed an impact from chemicals that had been used on the paintings while adding, “But we do not know the exact degree because proper tests have not been done”. He denied allegations that the frescoes were decaying. He acknowledged it was inevitable that historical sites with extraordinary architecture and beauty that attract large numbers of tourists would suffer detriment. “There are thousands of tourists arriving at Sigiriya and there is a degree of harm done by them that needs to be addressed,” Prof. Gunawardena said. He said last Poya day, 15,000 local tourists visited the historic site. Every day an average of 1,000 local and 1,200 foreign tourists visit Sigiriya while on peak days the numbers increase to 100,000 daily. Many of these tourists are ignorant of the value of Sigiriya and often are seen disobeying rules at the site. While information boards were displayed in a number of places asking tourists to avoid walking on the ancient parapet walls they are seen freely treading on them, even sitting and having a snack on them. The professor said these tourists should be managed. He said some go very close to the murals to take photographs and sweat – from the long climb up – drips off them onto the paintings, causing long-term damage. In a bid to tackle these problems the Central Cultural Fund has made four recommendations. “One is to cap the number of tourists arriving in Sigiriya as well as give them a specific place (five to six metres from the frescoes) to see the mural. The second is to stop them from taking photographs. Flash photography damages the paintings because they react with the chemicals used to preserve them. In other countries this rule has been successfully implemented. It is time we should do so too. The fourth recommendation is to introduce an audio system where announcements could be made stressing the importance of the murals to Sri Lanka and encouraging responsible tourism, the director said.